Audio guide through House of Marin Drzic, Dubrovnik, Croatia. Historical and mythic stories of Marin Drzic, croatian writer from 16. century. Marin Držić is the greatest Croatian playwright and comedist of all time, one of the most eminent Croatian writers in history, as well as one of the key authors of the European Renaissance comedy. He was born in Dubrovnik in 1508. He lived partly in Italy, partly in his hometown, and mostly somewhere in between, travelling around Europe, from Vienna to Constantinople. He died in Venice in 1567, where he was buried in the Basilica of Saints John and Paul, better known as Zanipoli. Marin Držić’s dramas ran through many printings and were translated to numerous languages, and his most famous comedy Dundo Maroje was performed in Australia, Austria, Bulgaria, the Czech Republic, Denmark, Finland, France, Germany, Great Britain, Hungary, Italy, the Netherlands, Romania, Slovakia, Sweden, Turkey and the USA. He died when Shakespeare was three. Molière was born a whole century after. A century and a half passed from his death until the appearance of Carlo Goldoni. Marin Držić was not born in the house you find yourselves in at the moment. The Memorial Museum dedicated to his life and work is housed here because the house leaning against the Domino church belonged to the Dubrovnik archdiocese. It is known for fact that Marin Držić was the rector of the church, and that the house served the needs of the clergy so it is legitimate to presume that he used it in some phase of his life. We also know that the Držić family, since ancient times, had the protectorate over the Church of All Saints (Svi sveti), popularly called Domino, as well as the right of patronage and usage of benefits, which was passed down to Marin from his uncle, the famous lyric poet Džore Držić. It is not known by certainty where the house he had actually been born and raised in was. According to the later data found in the documents of the sale of the Držić family house, we know that it was ‘somewhere near the Rector’s Palace’. 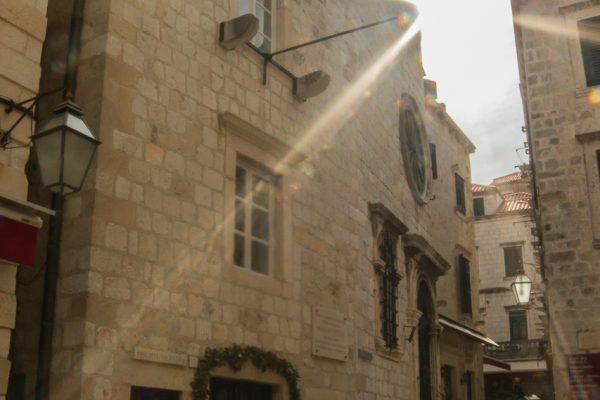 The House of Marin Držić, Dubrovnik institution in culture, was founded in 1989 and dedicated to the life and work of this great Croatian playwright and comedist. The permanent display of the House was conceived as a place of memory of this Dubrovnik Renaissance writer, who thanks to his multiple journeys, mainly to Italy and then to Vienna and Istanbul, was close to the European cultural heritage, but his whole literary work was based on the tradition of his city-state, where his roots go back to, as well as on the encouragements and influence of his contemporaries who had settled in Dubrovnik. The toponyms of Marin Držić’s life are here interpreted by different techniques: years of his biography (1508 – 1567) at the staircase, family and genealogical tree, Držić’s conspiratorial letters, reconstructions of object collections on the basis of Držić’s promissory note, references to the author’s theatre characters through costumes, modern audio-visual projections, all that in an attempt to transform the place where Držić had passed some of his time to a place of inspiration for the visitors of the House. Some of the imaginative “stops” of the permanent display take us back in space and time, clearly illustrating the life journey of a remarkable person. Apart from theatre programmes, posters and photographs based on Držić’s works, the museum collection of the House of Marin Držić is comprised of portraits of contemporary painters, small format sculptures and objects of applied arts. The activities of the House of Marin Držić are: collection, studying and further enrichment of theatre studies material, presentation of the collected theatre documents, posters, programmes and photographs of the staged Držić’s works in Croatia and around the world, technical and scholarly analysis and systematisation of the collection of the theatre and museum documents regarding Marin Držić’s life and work, permanent protection of theatre studies material and documentation, their direct and indirect presentation to the public by means of permanent and occasional exhibitions, publication of data and comprehension of theatre studies material and documentation by means of technical, scholarly and various other programmes concerning business activities, organisation of the technical library and publishing. The space of the House adjacent to the Domino Church at Široka Street was designed in the following way: there are two areas on the ground floor (the entrance hall with the reception desk and the introduction to the permanent display) and the so called “crypt”, a room for art and thematic exhibitions, workshops, book promotions and other activities. The permanent display depicting the life and work of the great Croatian playwright stretches through another two floors. Marin Držić was born in Dubrovnik in 1508, into a tradesman’s, commoner’s family. The writer’s father Marin and mother Anukla, from a distinguished and well-to-do bourgeois family Kotruljević, had twelve children, seven of which survived: five brothers and two sisters. As we shall see, Marin was nicknamed Vidra ,Otter, because he was constantly in debt and managed to skilfully evade from creditors his whole life. Otters are among the most skilful swimmers and hunters in rapids, lakes and turbulent waters. They inhabited Rijeka Dubrovačka as well, to which Držić – what a coincidence – often fled to look for a shelter from creditors. After he had become a student of divinity and taken over the protectorate over the Church of All Saints when he turned 30, the Republic of Dubrovnik (Ragusa) Senate unanimously appointed him to the post of the organist of the Cathedral of Saint Mary, or as inhabitants of Dubrovnik would say the Cathedral of the Great Lady. In addition to his clerical duties and apart from his theatre activities, Držić was active as a musician, even as the rector of the Church of All Saints in Dubrovnik. He knew how to play “any kind of instrument”, as his contemporaries wrote of him. The proof of that is a poem which Držić’s colleague and friend Mavro Vetranović wrote on the occasion of the sudden death of the famous comedist. ”By the sounds of a wailing lute and a silent flute” he sings of viola, cornet, clavichord, harpsichord, cordina, arpicordo… – a whole range of Dubrovnik Renaissance instruments Father Marin had played. The stay in Siena was very active and turbulent for the young Father Marin. He stayed there until 1545. The first written trace of him in Siena dates from 12 June 1541, when he was elected the head of the student hostel Casa della sapienza and the vice-rector of the University of Siena. That same year, he had some disagreement with his superiors at the hostel and at the Siena University, because of which he participated in a session of the city Senate… But the most known fact of that period in Siena was his participating in a play in a private house. By all indications, it was a comedy and Držić played the role of a lover. As such activities were strictly forbidden in the Siena of those times, the participants were severely punished. However, the authorities were lenient with Držić because of his privileged background. Consequently, today we have a written proof of it from the procès-verbal of the police investigation, which is the oldest source that brigs Marin Držić into connection with drama and theatre. In 1544 all of Držić’s brothers who were traders, Vice, Ivo and Niko, went bankrupt, except for the brother Vlaho who was a painter. His father had retired from the trade even earlier. The following year, in 1545, Držić returned to Dubrovnik, where he would not stay for too long. He got back to his hometown without graduating from the Siena University so he briefly, for only four months, replaced his brother Vlaho as a clerk in the wool exchange. In his hometown he met a distinguished Austrian count, Christoph von Rogendorf, who because of his alleged dissidence with the Habsburg court decided to come across to the Turks, pretending that he went to a pilgrimage to the Holy Land. “To see the world”, as Držić later declared, he became the count’s valet, “cameriero”, willing to follow him on his journey to Constantinople. As Rogendorf in the meantime settled his dispute with the court, instead of going to Turkey, off he went to Vienna, accompanied by Držić. They set off on Christmas Day of the same year, via Senj. Držić stayed in Vienna about three months, after which he again returned to Dubrovnik, convinced that “he was not cut out for the service”. In August of the same year, Rogendorf came back again to Dubrovnik, this time determined to go to Constantinople, after yet another dispute with the court. He took again Marin Držić into service, this time as an interpreter. They arrived to Constantinople in late September. All of this took place during 1546. In early January of 1547, Držić again returned to Dubrovnik. At a secret hearing in front of two members of the Dubrovnik Republic (Ragusa) Small Council he presented all the details of his journey to Constantinople with the count Rogendorf, as well as his relations with some other Ragusans in Constantinople. The people in question were the Bučinić brothers and Marin Zamanja. The writer’s picturesque and adventurous itinerary of these years says more than enough about his personality and nature, but also probably about the political circumstances related to the count Rogendorf and other Ragusians in Constantinople. Držić’s longest uninterrupted sojourn in Dubrovnik started in 1548 and it would last until 1562, the whole 14 years. All of his dramas that we know today were performed during that period. The comedy Pomet was the first play shown to the public and the actors of the Pomet troupe performed it at the so called Placa, that is to say, in front of the Rector’s Palace, during the Carnival time in 1548. The text of this comedy is nowadays lost. The same year Držić wrote the pastoral play Tirena, which was also staged prid Dvorom (in front of the Rector’s Palace), as well as the following year when it was interrupted by a strong bora wind. Tirena was the reason why, right at the beginning of the writer’s literary and theatre career in Dubrovnik, his envious enemies accused him of stealing from his older peer Mavro Vetranović. Držić defended himself by his own writings, but there was also Vetranović’s famous poem Pjesanca Marinu Držiću u pomoć, in which Vetranović publicly, by all literary means, defended his talented younger peer, who, for many reasons, had obviously already had lots of envious enemies in his hometown. At Martolica Hajdinov Zamanjić’s wedding, in late April or early May of 1550, was performed Novela od Stanca, esteemed one of Držić’s best literary compositions . In May of the same year, Držić was for the first time mentioned in documents as a priest, presbyter. This was probably the year his father died at a very old age. Father Marin’s turbulent and full-blooded life is not something we would, from our contemporary standpoint, connect to the priestly vocation, but it was something usual during the Renaissance. It were precisely intellectuals and artists who were very often choosing clerical professions by a family tradition, because by giving up on formal marriage and family, they would have financial independence and a way of life adaptable to a literary, artistic or intellectual vocation. Dundo Maroje, his most famous and appraised comedy, was performed by the Pomet troupe, alias Pometnici, how Držić called his actors, during the Carnival in 1551. Unlike the comedy Pomet, performed by the same troupe on an open-air stage, in front of the Rector’s Palace, Dundo Maroje was given its first performance in the City Hall, on the first floor of the Palace, in a sacred space of the Dubrovnik authorities. Although the text was lost, Dundo Maroje is considered to be a continuation of the comedy Pomet, with a few same characters and the same voice of the prologue, Negromant od Velicijeh Indija. The performance of this lost comedy once again agitated the then Ragusan public and authorities and triggered an open conflict between the author and some of his contemporaries, as well as new accusations of plagiarising. The same year Držić’s only book published during his lifetime, Pjesni Marina Držića ujedno stavljeni s mnozim druzim lijepim stvarmi was published in Venice. It was in large part a lyric collection of ballads in Petrarch’s manner, and the same edition included the pastoral play Tirena, the so called comediolas Novela od Stanca and Kako se Venere božica užeže u ljubav lijepoga Adona u komediju stavljena as well. During this audio-walk through Father Marin’s life and work we will also mention the names of the troupes of actors, as well as the town areas, which we know were used as venues. We are fully aware of auditors’ limited attention span, so there will be no time for digression about public life in Mediterranean urban areas during the Renaissance, or for a more detailed depiction of the carnival atmosphere full of masked processions and troupes which had been performing their plays at a certain time and place. They took place in manors, as was the case in Italy of that time. The stay in Siena, as well as a series of journeys throughout Europe, had an impact on our Father Marin so he transposed his experience to the Ragusan milieu. The beginning of his theatre production in his hometown was preceded by a period of sojourns abroad, education, various services, journeys, intrigues, debts, and all that was woven into the fabric of rich life experience. Of all Držić’s troupes of actors, we have pointed out the Pomet troupe or the Pometnici, as the author called them himself. According to the found data, as we do not know how many revivals there were and how often they were performed, the Pometnici staged most of Držić’s works in Dubrovnik. That was his first and obviously most important troupe, at least the first we know of in Dubrovnik, precursor to what would today be called the organized theatre. Those troupes of actors were made of young men, squires or commoners. It is hard to presume if there were any women – actresses, unlike the similar theatre phenomenon that took place in Italy of that time. It is still a partly open and not thoroughly studied question. Apart from the Pometnici, we know of the Njarnjas known for their performance of Skup, as well as the Garzarija, the troupe named after the spinnery Garzarija. Finally, there was the Bidzaro troupe, assembled for the performance of Hekuba, the only tragedy in the writer’s complete work. It was named after the Ragusan squire family Bizzaro because the members of the troupe were young noblemen. Apart from the fact that theatre plays were an indispensible part of aristocratic weddings, they were also staged in open and closed venues so we can say that Marin Držić’s theatre in Dubrovnik was also an ambient theatre. In 1552, the writer’s mother Anukla died after having left three quarters of her dowry to the eldest son Vlaho, only one third to Marin and to the other living children nothing but a mother’s blessing. In 1554, at Vlaho Gučetić’s wedding, the Garzarija troupe performed a partly preserved comedy Džuho Krpeta. The comedies Pjerin, Mande ili Tripče de Utolče and Arkulin, preserved only in fragments, belong to the same period. It is not familiar when exactly they were performed nor in which order. In 1555 the Njarnjas performed Skup at Sabo Gajčin’s wedding. In 1556 the pastoral play Grižula was performed at the wedding of the squire Vlaho Sorkočević. In 1557 Držić was a guest of the squire and writer Mikša Pelegrinović from Hvar. Finally, in 1559 the Bizdaro troupe performed Hekuba. It is the last precisely established information about the staging of Father Marin’s work during his lifetime. Because of yet another departure to Italy in 1561, Marin legally and by mutual consent broke off all business connections with his brother Vlaho. In December 1562 Držić was in Venice where he was appointed to the post of the chaplain of the Venetian archbishop. In 1563 he stayed for a short time in Dubrovnik to give a statement in court. In late April or early May of 1566, Držić was in Florence, where he wrote his famous five conspiratorial letters to the Tuscan duke Cosimo de’ Medici. They were found in 1930 in the Florentine national archive Archivio di stato by the French Romance and Croatian studies expert Jean Dayre. The first and by all indications longest letter was not found to this day, and in the others he called upon the duke to use his political, diplomatic, personal, military and financial power to help to bring down the aristocratic regime of the Dubrovnik Republic. The origins and gradual development of that idea could be traced throughout his works all the way to Hecuba. His letters are an attempt to put that idea into action. Considering the author’s very dynamic and turbulent life, as well as the connections he had with many politically active people outside of Dubrovnik, he certainly was in the way of the diplomatically oriented Dubrovnik authorities, known among other things for espionage, because the ambivalent discourse of his comedies was no longer a mere theatre subversion. However, in 2007, in the same Florentine state archives, historian Lovro Kunčević found the fifth letter to Cosimo, dated 27 July 1566, as well as fragments of the correspondence regarding Držić’s letters between Cosimo de’ Medici himself and his secretary Bartolomeo Concino. This shook some of the major interpretations and the whole question is open even today because there are no credible data that would allow the exact interpretation. What is sure is that the letters written in the atmosphere of extreme fear and anxiety, almost obsessively, in one breath, were dated day after day. He obviously waited for the reply himself as in the fifth letter he announced that he would travel to Dubrovnik, and to then Florentine authorities, that is to say to Cosimo as well, he presented that he had stayed in Florence “for four months for fun”. In 1567 Držić died in Venice where he served as the chaplain to the Venetian archbishop. The circumstances of his death on 2 May were not known. We are informed about the death, which happened on that date and in that place, by Držić’s nephew Jere, Vlaho’s son, who in the family genealogy written down in 1603 knew the exact day of his uncle’s death, as well as that he had been buried in the Basilica of Saints John and Paul. Many Dubrovnik writers immediately responded with cordial verses to the news about Marin Držić’s death: the poet was lamented by the old friend Mavro Vetranović (already mentioned in this audio-walk) in the posthumous poem Na preminutje Marina Držića tužba, then by his younger follower from Ston, Antun Sasin, in the epitaph U smrt Marina Držića, as well as by two distinguished members of the Ragusan academy Složnijeh, Miho Monaldi and Sabo Bobaljević. Marin Držić and his comedies can compete with the greatest world comedists, and maybe the best proof of that is the fact that they are performed to this day; moreover the audience is thrilled by their dynamism and contemporary overtone. Not only because of the masterly drama, magnificently depicted comic characters, successful situational comedy and discourse, but also because of the frequent critical reflections on human destiny, ironic comments and the overt personal vision of the world, which in some works develops into a genuine critical utopia. In order to achieve criticism through laughter and weave a multi-layered genre, Držić first of all needed to depict his fellow-citizens with great precision and skill, and then through them his contemporaries and the human race as such. That is why Marin Držić is a universally good and important writer. There are numerous works of criticism and literary history about his significance, a whole range of research works that justly compare him to Shakespeare and associate him with all the most important, aforementioned authors of the world history of comic writing. Although his works are translated to and performed in all the mentioned languages, due to the fact that he belongs to a “small” language and culture, he is not famous as Molière or Goldoni nor represented in the general culture of Europe. Držić’s works preserved to this day include a collection of poems in Petrarch’s manner, the pastorals Tirena, Venera i Adon, Grižula ili Plakir as well as the comedies Džuho Krpeta, Pjerin, Mande ili Trpče de Utolče, Arkulin. He is also the author of one tragedy called Hekuba. His major achievements important in the context of the European literature definitely include the carnival play Novela od Stanca as well as Skup, and most notably Dundo Maroje. Novela od Stanca (“a novela” in this context means “a joke”) written in the tradition of medieval farce, is a genuine, extremely original little master piece. It tells a story about Ragusan youngsters who double crossed an old man that one day came to Dubrovnik. Apart from many humorous anecdotes and dialogues, there are frequent literary allusions to the contrasts between youth and old age, urban and rural culture, as well as the eternal conflict between naivety and stupidity on one hand, and on the other hand sophisticated wisdom that easily changes into cunning and irony, even a sort of maliciousness and manipulation. Modelled on the Plautus’s play, Skup deals with the theme of avarice, but this is not a mere remake. Thanks to its elaborated plot, skilful development of the action and excellent dialogues it can be considered one of the best comedies on that theme ever written in the world. Even so, maybe Dundo Maroje is his best comedy of all because it is most comprehensively written. It depicts the longest list of characters and offers the most extensive framework of ideas. In one of its two prologues – and that is to this day one of the most challenging and interpretative questions of the studies of Marin Držić – it tries to encompass very serious issues, and even the questions of Man’s fate and survival. Držić here talks about two types of people, those who are nahvao (fake and hypocrite) and those who are nazbilj (honest and real). The ambivalent nature of laughter allows him to craftily, in his recognizable way, criticize the Dubrovnik nobility, but with such a cunning technique that even they themselves get trapped in that ambivalence; Držić makes them see themselves as “real people” (“nazbilj”), but they know that is not the case. After Držić’s death, right to the beginning of the 20th century, it is not known if Držić’s comedies had even been performed in Dubrovnik or outside of him. The credit for the revival goes to the director Marko Fotez, one of the initiators of Dubrovnik Summer Festival, because thanks to his stagings Držić’s plays managed to take hold among the inhabitants who even today regard them as a part of their identity.